Constant Grip High Speed Standard and King Bore Thru-Hole Power Chucks Sizes 6" Thru 24"
Constant Grip, internally counter-balanced design that reduces grip loss from centrifugal force of the jaws at high RPM. Easy Retrofit on most all existing NC and CNC lathes utilizing the same drawtube and actuating cylinder including Japanese types. 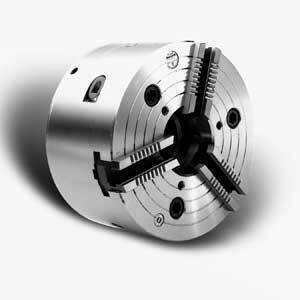 Accurate - repeatability of ± .0005"
Utilize existing top tooling by selecting style of master jaws from 1.5 x 60, 1/16" x 90, Am. Std. Acme, Am. Std Tongue & Groove and Square Serrationsor substitute mono block jaws. Sets can be mixed styles. Also available in 2-jaw style. 1. Dimensions listed are with 1.5 x 60° master jaws. Some dimensions will vary using other Master Jaw types such as Acme, 1/16" x 90° or Am. Std. Tongue & Groove. 4. Standard master jaw serration for 20 and 24 inch chucks are 3mm x 60°.